Beautiful lakes, streams, potato farms, mountains, and vast tracts of wooded land make for lovely, scenic rides in this part of Maine. The 16-mile loop provides a gentle introduction to road biking on low-traffic roads through rolling farmland with a view of Ripley Pond. The 31-mile loop includes a visit to Dexter and Wassookeag Lake. The 47-mile loop goes through the towns of Sangerville, Guilford, and Cambridge. 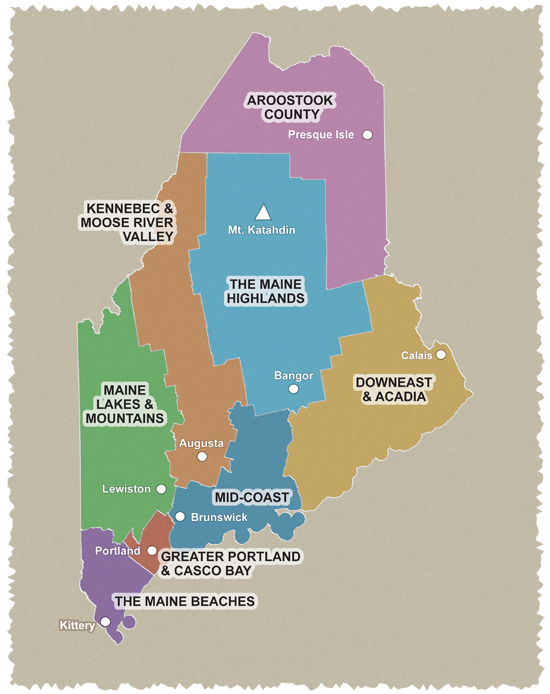 The pleasant 56-mile ride takes cyclists through portions of three Maine counties: Piscataquis, Somerset, and Penobscot. The loop includes the communities of Dexter, Dover-Foxcroft, Guilford, and Cambridge. Access to these communities is easy because of the well-maintained highways and rural roads. Cautions: Moderate traffic. Some roads have no shoulders. . Starting point: Rides originate at the Indian Lake Dam parking area in the village of St. Albans, just east of the intersections of ME 152/23 and ME 43. From I-95, take Exit 150 in Pittsfield and follow ME 152 through Hartland to St. Albans and the start of the tour.